Chapter 5: "The Slave Trenches of Hakotep"
The Sky Pharaoh Hakotep I has risen and launched an attack against the city of Wati! The heroes return to Wati to defend it against this menace, only to discover that the attack is just the preface to a larger invasion of Osirion, controlled from Hakotep’s own flying tomb. Journeying to the Slave Trenches of Hakotep, the heroes must learn how to activate an ancient weapon to pull Hakotep’s tomb back to earth. Will the heroes bring down the flying pyramid of the Sky Pharaoh, or will their bones join the thousands of skeletons that lie crumbling within the Slave Trenches of Hakotep? 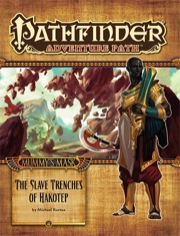 “The Slave Trenches of Hakotep,” a Pathfinder adventure for 13th-level characters, by Michael Kortes. A look into the ancient Shory people and their amazing flying cities, by Neil Spicer. A collection of powerful artifacts and strange relics recovered from Osirion’s First Age, by Tim Hitchcock. A thrilling urban pursuit in the Pathfinder’s Journal, by Amber E. Scott. Four exciting new monsters, by Robert Brookes, Adam Daigle, Michael Kortes, and David N. Ross. The Slave Trenches of Hakotep is sanctioned for use in Pathfinder Society Organized Play. The rules for running this Adventure Path and Chronicle sheet are available as a free download (595 KB zip/PDF). Note: This product is part of the Pathfinder Adventure Path Subscription. Ships from our warehouse in 1 to 5 business days. This product is non-mint. Refunds are not available for non-mint products. The standard version of this product can be found here. Michael Kortes, author of Entombed with the Pharaohs and The Pact Stone Pyramid returns to Osirion with The Slave Trenches of Hakotep. This adventure features lots of dungeon crawling, but also some exploration and role-playing as the PCs try to complete the ritual necessary to bring down the flying pyramid of the Sky Pharaoh, Hakotep. 1) Best Hook in the AP: Flying pyramid shows up over Wati demanding the PCs turn themselves in or it will destroy the city. What more do you need? This hook still doesn't necessarily work with PCs as tomb raiders hook from the beginning of the AP but most PCs would feel responsible for causing this given that it's directly related to them killing the BBEG in the last book. 3) The Sekpatra statues are a nice touch as they provide some background for interested groups about the commander of the flying pyramid, Isatemkhebet who is also the first major villain that the PCs face in this adventure. Isatemkhebet had the members of the Sekpatra family petrified, disfigured and put on display. Although it is difficult to do, it is possible for the PCs to free the family from their ordeal after which they can provide useful information and even some assistance in their fight against Isatemkhebet. 4) Scrivener's Wall: The scrivener's wall allows the PCs the opportunity to have a written exchange with Hakotep, the BBEG of the entire AP, before the final adventure. This is full of possibilities and significantly increases the meaningfulness of the first dungeon-crawl. 6) Tef-Naju: The main guardian of the Slave Trenches is a sympathetic, intelligent and complex NPC called Tef-Naju. The immortal shaitan's motivations are well developed and allow him to become either the PCs' greatest ally or most enduring villain in this adventure. Tef-Naju's disposition towards the PCs will be greatly affected by the choices that they make as they explore the Slave Trenches. 7) Interesting Adversaries: Aside from Tef-Naju, the PCs can interact and potentially even make deals with a number of adversaries in this adventure. For example they can decide to ally or not with a vulture-headed sphinx in its power struggle against a mythic level roc. Ptemoneph, the ghost sorcerer who trapped himself in a psychic centipede jar, could also provide an interesting roleplaying opportunity. Jeshura, a div who betrayed Hakotep, could become another unlikely ally in the PCs quest to bring down the Sky Pharaoh. 9) And the award for the Best Trap of the AP goes to: Telekinetic Enucleation Trap. Let me quote my favorite section "The telekinetic forces attempt to forcibly pluck eyes from sockets - on a success, the eyes drop to the ground and roll down the sloped floor toward area H5." I like that this adventure also features some non-standard traps such as the Haunted Items that can lead to some of the PCs becoming possessed. I also like the teleportation trap in the Guardian Vault that can lead to one of the party members being split from the rest of the group. 10) Great Ending: As the Slave Trenches are activated, the PCs have to battle hordes of giant skeletal creatures that rise up to stop them. The battle over, a giant flying pyramid comes crashing down next to the PCs. It's epic, it's cinematic and it leads right into the next adventure. 1) Information dump at the beginning at the adventure: Within the span of a single encounter (when the PCs interact with Chisisek's mummy) all of the following terms are introduced: Aeromantic Infandibulum, Akhumen, Khepsutanem, Sekrepheres, Tekramenet, Sekrephrenet and Akhumemnet. This felt too confusing even for me, and I know all the background of the adventure, imagine how the players will feel. 2) Overuse of mummified template: There are just too many monsters in this adventure that are given the mummified template. In some cases it works, but in others it comes across like a weak attempt to add some Egyptian flavor to a monster that would otherwise seem completely out of place in this setting. I'm especially thinking of the mummified Gray Renders and Spinosaurus (although I do like what Sensuret, the Tribe-Eater is meant to represent, just not the templates that are stacked onto it). 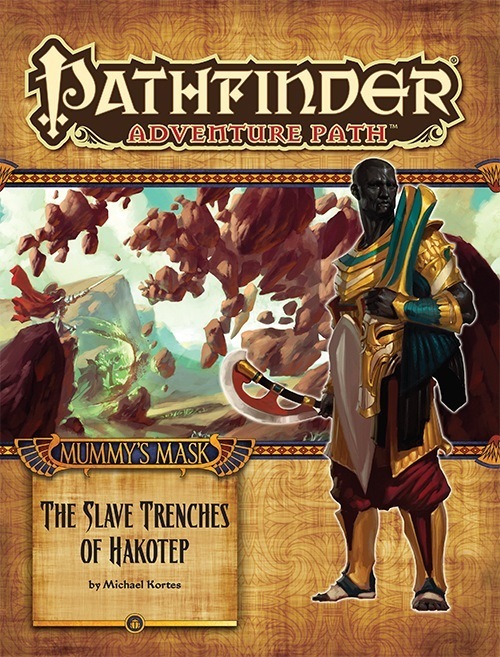 The Slave Trenches of Hakotep is my favorite installment in the Mummy's Mask Adventure Path and the best Paizo adventure I've read in a while. Michael Kortes has created an evocative adventuring site on a grand-scale that provides a good mix of open exploration, dungeon crawling, role-playing and epic storytelling. Great stuff. 5 stars. I have really liked the adventure. The first part was your basic dungeon crawl, albeit set in a flying pyramid, and most of the monsters were mummified, just to add a little of something extra. The second and third parts were basically the same, save that there were more puzzles than in the first part, and there were the undead elementals, that tended to appear whenever our DM felt they were needed to appear. "Slave Trenches" was a straightforward dungeon crawl (no KP or anything like that) and we really enjoyed playing it. On the flip side there was a distinct lack of setting - of Wati or anything like it. The previous two parts were in reverse: very acting-heavy, but they were interconnected, we had an idea where to go. Here it was all rather loose and unconnected, and, frankly, when we shifted the background from Wati to Tephu it didn't change anything important in our dynamic. Otherwise, it was still a great game. I really like the layout of this adventure. I feel that having multiple six to ten room dungeons trumps the one dungeon with forty to sixty rooms. This adventure is well laid out. I like the NPCs, the fights, the dungeons, and the traps. I see a few potential downfalls: one, the activation order seems a little hard to figure out and could potentially take some time and bog things down (but having to think this late in the game isn't that harsh a downfall). The second, I see the possibility of an anticlimactic ending. If the PCs fight the boss prematurely and defeat him, then the final fight might just be a push over. All together a good tone was set for this adventure and I hope they keep the good work going into the final step. Read my full review on Of Dice and Pen. While there are aspects of the adventure that I like (including one great NPC), overall The Slave Trenches of Hakotep is a long slog through a succession of dungeons, each filled with traps and monsters, and many of them forming pieces in an overall puzzle for the PCs to put together. Apart from that one NPC, there's very little opportunity for roleplaying interactions, and very little to keep the adventure spiced up and moving along. It will take many sessions to play through, and most of those session will start to feel like the same thing over and over again—and that's not good. Short Version: A solid adventure that didn't quite gel for me. This adventure has good encounters, brutal traps, some interesting NPCs, and a solid central conceit that'll keep PCs moving. But the setting of the adventure never really seemed organic to me. It doesn't come across as anywhere that was intended to be used, which works for the tombs throughout the path but seems much weirder here. He gives us chocolate cake!" Sounds terrific! More Kortes is good Kortes! Oh so very much count me in. My praise for Kortes is legendary. Shory? Flying pyramids? Oh hells yes! Everyone is Hotep when Kortes and Osirion collide! June sounds like a fun month for products. Is it just me, or is this adventure path mirroring Rise of the Runelords a bit? While there's nothing wrong with it, I was kind of hoping they'd visit more locations in the actual adventure, rather than going back to the same city over and over again. That means a lot coming from the author of "Crucible of Chaos" the seminal 3.5 module which introduces us to the Shory and the wonders of Aeromantic Infandibulum. And this from one of the co-authors of "Osirion: Land of Pharaohs" (along with Todd Stewart), which is the first serious treatment of the Slave Trenches dating back to 2009. I hope this AP volume does it justice. And this from a Venture Captain with impeccable taste that I send monthly checks to. And this from the guy who expertly kicks off the "Mummy's Mask" series and knows more about Osirion than pretty much any other freelancer I know. And a thank you to both Liz and Adam for letting me know this thread was here. But now the pressure is on as "Slave Trenches" better turn out to be worthy of your support! And this from the man who brought us both the Pact Stone Pyramid and Entombed With the Pharaohs, forever enticing us with the Aucturn Enigma and the countdown clocks! If the past is any indication, you're going to blow us all away! So happy to see Kortes back in action. Rock the house, Mike. We all know you will. This year is shaping up to be a great year for APs. We get both an Egyptian style one and a Numerian one. I can't wait to see the creatures and NPCs we will get for both of these APs. Ditto! I'm really excited for the APs this year and extremely excited to be going to Paizocon this year for the commencement of Iron Gods! Whoo! Go Mike! This guy writes a badass adventure, and runs a rocking game! I hope this AP volume does it justice. Absolutely! I'm thrilled that the stars finally aligned to bring about what the people have been demanding for some time. And as I said in that thread, Mike is a first rate storyteller, and I will chug fist-fulls of hard earned cash after any products he finds the time to write. Never been happier for my AP subscription. Any word if the magical technology that lets pyramids fly comes from another planet? As the beginner of that thread, let me also say, "Hurrah! Kortes rises again!" Cover image and description updated! Awesome - wonder if that stunning, obsidian dood has some Living Monolith levels going for him? New artifacts and info on the Shory, sounds awesome. Removed a post and reply. This kind of discussion probably belongs in its own thread, not the product discussion thread. Woo! Very proud to see my name up there, and thrilled to be in a Kortes adventure. Likewise honored to share credits with you Robert! Which monster did you design? Er, maybe that can't come out just yet though. P.S. I need to get me a super-cool set-animal helm just like the one on the cover (Kudos to Rob McCreary for that). I am certain it is on the very cusp of fashion, or will be shortly. I'll gladly spill the beans once it's out! This is one issue of awesome! I can't wait to see those ancient Osirion artifacts and relics. If I remember correctly the last issue had too cut a monster from it's bestiary, will this creature be in this book or the next? Maybe. We're pretty good at getting monsters that deserve to see print who were cut for space reasons into print. But believe it or not... a not insignificant amount of monsters get cut because they end up deserving it. Those loser monsters end up forever on the cutting room floor where they should stay. AKA: If someone likes the monsters we print a lot... that's partially due to us doing our jobs and shielding that person from monsters that would disappoint and lower the expected quality of monsters Paizo publishes overall. Have there been any monsters cut because of the artwork for it? Slightly off topic, but my curiosity has been stirred. What was the worst monster (or monsters) that you have had to cut - and why? I can understand curiosity being stirred, but I'm not in the habit of showing off things I feel to be inferior. Partially because I'm not interested in publicly badmouthing art, but also because I prefer to focus on the good stuff. You're quite welcome, Neil. Thank you so much for such an awesome and well-researched article. It was a delight to develop. Shipping starts Wednesday according to the July shipping thread. Did you then order new artwork and then use the monster? It seems like if the design is done, it would be cheaper to order a new piece of art, than to order a new piece of art *plus* a new design for a new monster.